Foxing reaches for the skies on its biggest and best record, country singer Shooter Jennings fires off a spotty but enjoyable new collection, and more in this roundup of new releases. Foxing has always been ambitious. From its ornate music videos to the post-rock sprawl of 2015’s Dealer, the band has never taken the direct route to anything. This was evident even before Nearer My God was released, as the band put out five different versions of the title track, each one seeing vocalist Conor Murphy tackle the song in a different language. 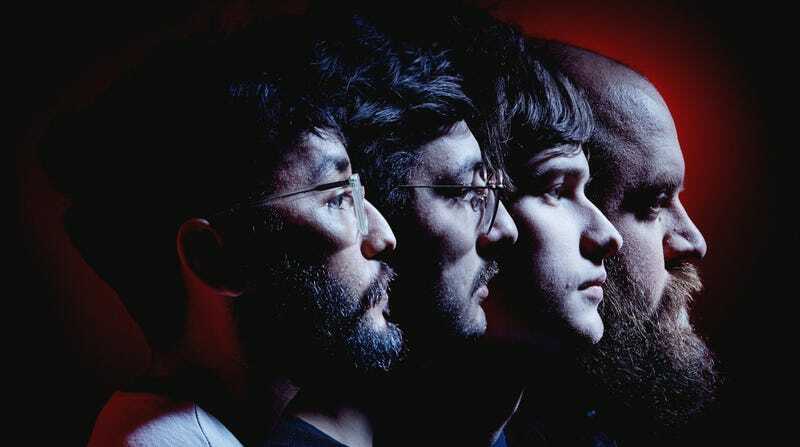 It was impressive, not only because it showcased how strong Murphy’s singing has become since the release of Foxing’s debut album, The Albatross, in 2013, but also because it hinted at the full scope of the group’s latest. While Foxing was once pegged as an emo band, it always wanted to achieve more, and Nearer My God is proof of it. Opener “Grand Paradise” is more Prince than The Promise Ring, with thunderous electronic claps serving as the backbeat to Murphy’s effects-drenched voice. Even when Foxing plays the part of a rock band, the songs buck easy definition. “Slapstick,” “Nearer My God,” and “Crown Candy” are all expansive works that pull from post-rock, indie, soul, and electronic without feeling like some ham-fisted combination. It’s as impressive as it is expansive, a perfect showcase for modern emo’s elasticity. RIYL: Radiohead. The Appleseed Cast. Sad songs that make you want to dance. Upon first listen, The Beths’ debut album, Future Me Hates Me, bleeds together too much, the songs slipping imperceptibly from one to the next. But soon enough, the bubble-grunge riffs and Motown-backup-singer “whoa-ohs” start to distinguish themselves. The New Zealand band has two gears: The first is a more classically pop-oriented retro sound, like a ’60s girl group doing the shimmy-shimmy-cocoa-pop but with guitars and a shoegaze influence. The second is a caffeinated ’90s alterna-rock head rush, with Superchunk-level riffs and Velocity Girl vocals courtesy of singer-guitarist Elizabeth Stokes. It can tend toward the simplistic—the title track apes early Weezer, for example—but the middle of the album (particularly “Not Running”) shows that when the band embraces its more rambunctious and harder-edged sound, it captures something powerful. By the time the last notes of the slow-build barnburner “Less Than Thou” close things out, Stokes’ mission is clear: a joyous refusal to stop riffing, no matter how heartbroken. RIYL: Velocity Girl. The Rentals. The idea of a Kiwi Superchunk that loves doo-wop. Shooter Jennings’ 10th album boasts considerable polish, which is unsurprising for a country star with his pedigree. (He’s the only son of legends Waylon Jennings and Jessi Colter, if you’re new to the club.) Sometimes, it’s a bit too much polish, though, as in the glossy, horns-drenched kickoff, “Bound Ta Git Down.” Things thankfully get a little rowdier in the anthemic “Do You Love Texas?” complete with slide guitar and a “hell yeah” chorus, and a song succinctly titled “D.R.U.N.K.” But Jennings really shines when he takes things down a notch (or nine), as in the mournful “Living In A Minor Key” (“I still think Hank Williams is as good as gets,” and it’s clear he’s talking about the senior) and “Shades & Hues.” But the rest of the album is just a buildup to the exemplary trifecta that ends the record: the sunny yet somber nostalgia of the romantic ode “Fast Horses & Good Hideouts,” shadows in the mind and on the highway in “Rhinestone Eyes,” and “Denim & Diamonds,” which would fit right in on a classic radio station featuring early Seger or Eagles. RIYL: Any of the Hank Williamses. Texas and/or Nashville. Pickup trucks and dogs with sad faces.